An Association of Earth Moving Equipment Owners, Operators and Mechanics have appealed to the government of Ghana to help find more practical ways of dealing with their members who get into trouble with the Police. The Association which members say has existed in Ghana since 1985, recently went through all registration procedures and decided to re-launch. The event was held at Suame in the Ashanti region. 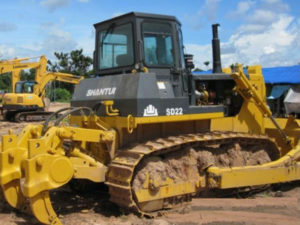 Chairman of the Association; Ebenezer Kwame Boadi explained to Joana Somia of www.ghanagong.com and www.rawgist.com that the earth moving machines are very expensive and are very costly to maintain. “Sometimes, the Police arrest an operator and decide to confiscate the machine…even if they return it to you, they do so after a very long time by which time the machine has generated lots of problems” he recounted. He called for a working agreement such that issues are easily dealt with and machines released to the owners for business. The chairman praised the membership of the Association for being united and encouraged them to carry on in the spirit of unity.